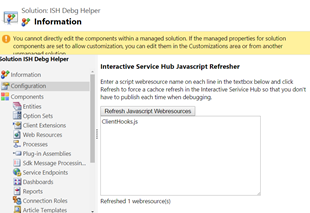 The Interactive Service Hub (ISH) was first introduced in CRM2016 and has been improved with more support for customisations in CRM2016 Update 1. I see the purpose of the ISH at this stage is not to replace the main User Interface but rather as a testing ground for the principle of bringing the MoCA mobile/tablet native client platform to the web client. I think of it similar to the introduction of the Polaris UI back in CRM2011 – there are many similarities in that they both only support a limited set of entities and have limited customisations features. The main difference is that the ISH is being incrementally improved with each release, where the Polaris UI was more of a throw away proof of concept. At this stage the ISH is only supporting 'case' oriented operations but I'm sure it'll eventually graduate to support all Sales, Service and Marketing features. So why the new approach the UI? Surely it would be better to improve the existing UI incrementally rather than replace it? 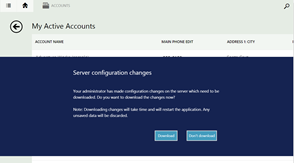 One of the key drivers for the Dynamics CRM Team over the last few releases has been 'configure once deploy everywhere'. This allows us to configure business rules that can be run on all devices/platforms reliably without having to perform separate testing and perhaps re-write to target different clients. The maintenance of having multiple user interface platforms is considerable so it's a natural step to try and achieve some degree of convergence between the mobile/tablet/web/outlook interfaces. <p>Each time you open the web client, the homepage.aspx or Main.aspx has to request the metadata for the specific resource (view or form) and then combine it with the requested data. Although there is browser and server side caching in place, this is still costly in terms of the requests and rendering overhead of the browser. The 'turbo forms' update in CRM2015 Update 1 has really helped with the speed of this since it minimises the resources that requested with each navigation however fundamentally it is still limited by the page per browser request architecture. The ISH is more what we would call a 'single page application'. The sequence is very different in that there is an initial download of metadata and then subsequently all user interactions only request the actual data using the Organization.svc and OrganizationData.svc. </p><p>This single page approach has the advantage that it makes navigation super slick but with the rather annoying drawback that there is an initial wait each time the ISH is opened where the metadata changes are checked. The first time you open the ISH all the metadata is downloaded but from then on only the differences from the last open are downloaded. If there haven't been any changes then it's <strong>super quick</strong> because all the metadata is stored in the <a href="https://www.w3.org/TR/IndexedDB/" target="_blank">browsers indexed Database</a> but if you've done a publish then the next open can take a while. Furthermore, the new metadata won't be downloaded until you close and re-open the ISH - this is different to the Web 2.0 UI and can lead to the client working with stale metadata for a time. The Indexed Database is one of the significant differences between and HTML5 single page app and a more traditional Web 2.0 architecture. Note: For now the ISH mostly uses the SOAP/Xml based Organization.svc rather than the new JSON based Web API. The speed of the metadata sync can be helped further by using the 'Prepare Client Customizations' button on the solution since this will pre-prepare the download package rather than waiting for the first person to open the ISH to detect the changes in the metadata. The difference between the MoCA client and the ISH is that the MoCA asks if the user wants to download the updates – presumably because you may be on a low bandwidth connection. Setup Fiddler's Auto Responder to point to your local webresource file as per my instructions. Note: You can enter only part of the webresource name and it will use a regular expression to match. Use Ctrl-F5 on your ISH Page and when re-loaded the Web Resource will use the new version since the debug utility has forced a new download and updated the Indexed DB storage. Sweet – but what about the MoCA client? Note: You must be pre-authenticated for this to work. Since the ISH and the MoCA client are build using the same platform you can now use the ISH Debug Helper from the same browser session to perform the same script refresh! This is actually an excellent way of testing out your Scripts on the MoCA client! For more information, check out the comments in this tip of the day. I'd really encourage you to check out the ISH and use the New CRM Suggestions site to record anything you find that you would like to see in subsequent releases. Whilst I suspect that the existing 'refreshed' UI will be available for some releases to come, it is likely at some point to become the new 'legacy' UI and with on-going investment being made in the ISH style UI. In part 2 we'll look at some limitation of the ISH and how to get around them.